You may think it was a little strange, I mean, I certainly did seeing your obsession with Whittaker chocolate and snickers bars, you would think I would make something along those lines no? But I think this tart really reflects your personality. You want to know why my friend? Pie, you are one of the bestest, sunniest friends I could ask for. We may have our differences (I keep telling you, Rugged boys over Pretty boys! ;)) but at the end of the day, you are person I want to turn to first! 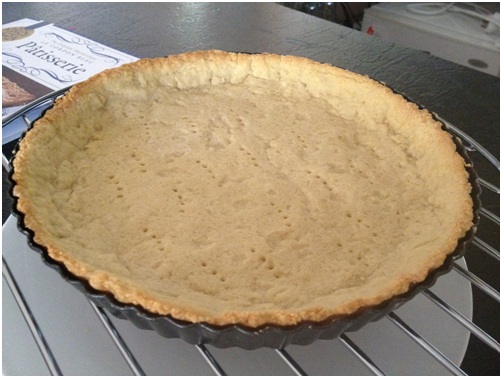 Happy [belated] 17th birthday Pie, hope you enjoyed your tart as much as I loved making it for you! Stir in the sugar and make a well in the centre. 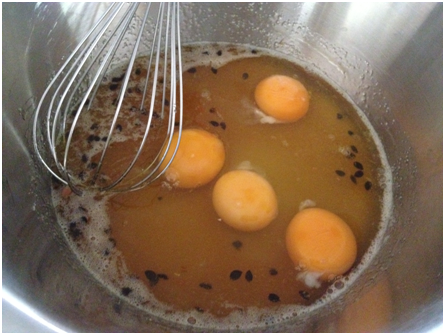 Pour in the combined eggs and essence and slowly work the mixture together using a palate knife or pastry scraper. If the dough is too dry, sprinkle with a little water until it just holds together. 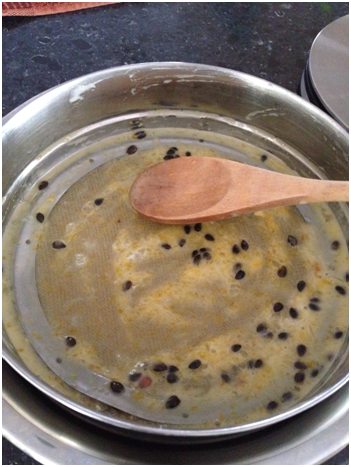 – Add in the egg and vanilla and process until the mixture comes together as one large clump. 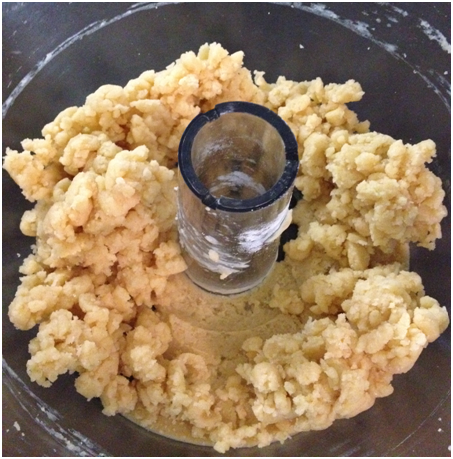 Remove the dough from the bowl (processor) onto a lightly floured surface. 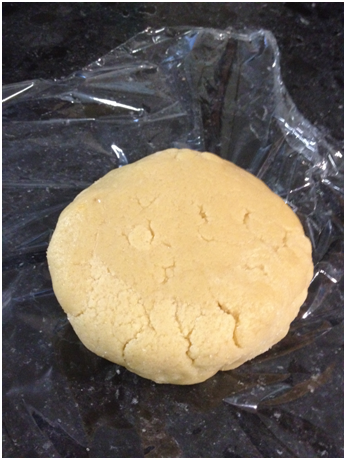 Using the palm of your hand, smear the dough away from you until it is smooth. 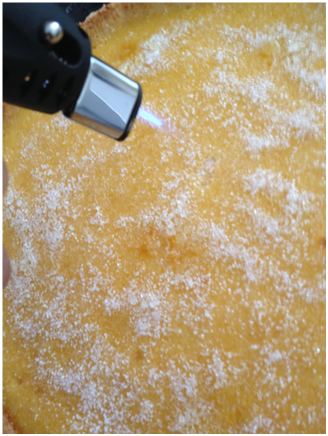 Roll out the pastry onto a floured surface to 3mm thickness. 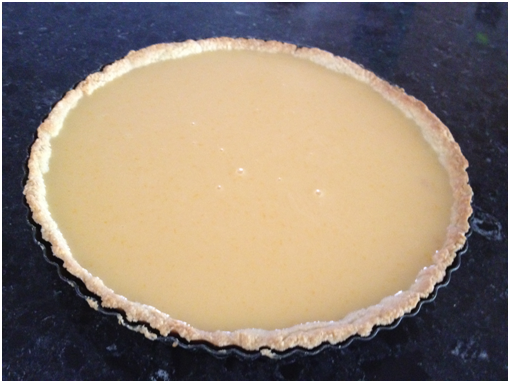 Ease the pastry into the tin, pressing it into the corners, then trim the edges neatly. Prick the base lightly with a fork and chill for 30 minutes. 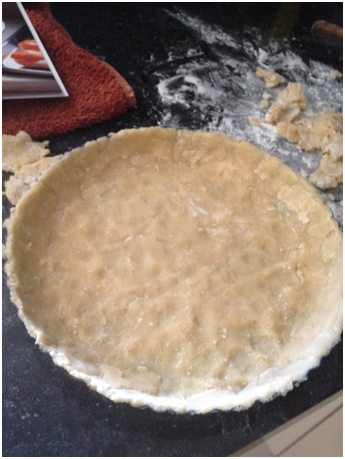 Cut a circle of baking paper slightly larger than the tin and place into the pastry case. Fill with baking weights. Bake for 10 minutes then remove the baking paper and weights and return to the oven for 5 minutes (8 minutes) or until golden. Reduce the oven temperature to 140 degrees C.
Warm the cream in a small pan over low heat. Leave to cool completely then remove from tin (I chilled mine for 10 minutes before doing this) and chill for several hours to all the centre to firm up. The crust looks perfect, CCU! What a wonderful friend you are. Now let me seriously tell you – that’s a WOW pie, Uru! 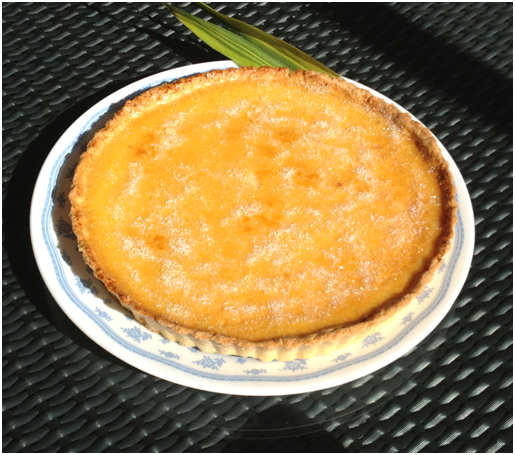 I love the passionfruit or Crème Brulee in a pie/tart. Really, impressive! Oh wow! this looks delish! Glad I found your blog. Thanks to jenbeans. I hope to be inspire my child to cook and bake as your Mom did to you. 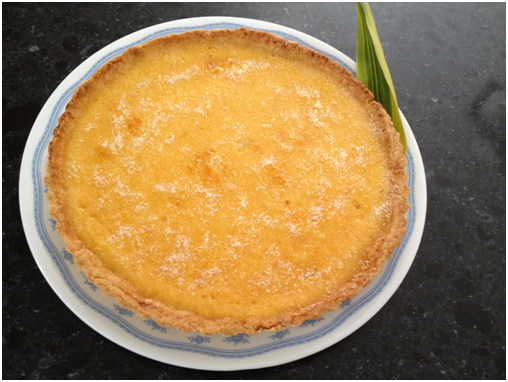 Such a delightful tart, perfect for celebration! What a ‘nice’ (in every sense of the word) tribute to your friend! This birthday ‘pie’ sounds wonderful, too. Gorgeous Pie CCU! You never fail to impress 🙂 Cheers! What a gorgeous tart! your friends are so lucky to have you to make them birthday treats! A beautiful tart to accompany a beautiful tribute. You have a lucky friend, CCU. I’m behind on my blog reading… WELCOME BACK!!!! What a perfectly delicious tart! Happy belated birthday to Pie 🙂 The tart looks great. I want to steal a bite now! Love the pie and love the passion fruit adds on. I surely wanna try a slice of this pie. You made the short crust from scratch? awesome! so much better home made right? 😉 Love your pie! Mmm… passionfruit creme brûlée sounds so glamourous! Stunning pics and delish recipe, this seriously looks soooo yummy! Cute post. What a perfect looking and delicious pie. I would love a slice right now. Oh wow! That tart looks amazing!!! Great post! This is a beautiful post and a magnificent tart. Lovely letter, your friend must be delighted! 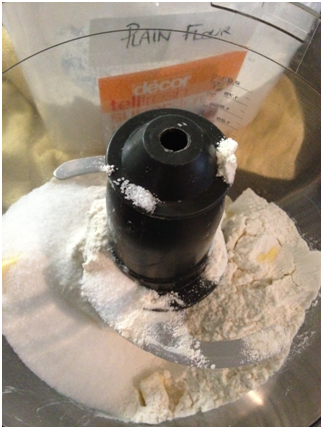 I like to put my hands into my pastry dough, but I can appreciate the convenience to use a food processor!! 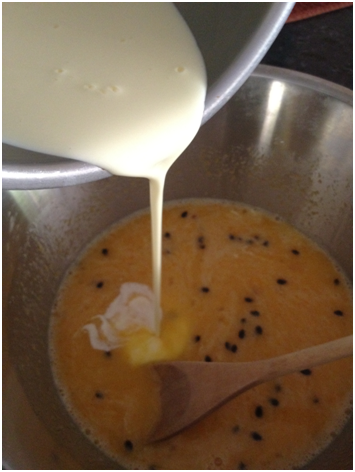 This passionfruit creme brulee filling looks amazing!! And happy birthday to your dear friend. What a lovely pie for a special friend. Beautiful post Uru! What a lovely pie with passion fruit it sounds so exotic. 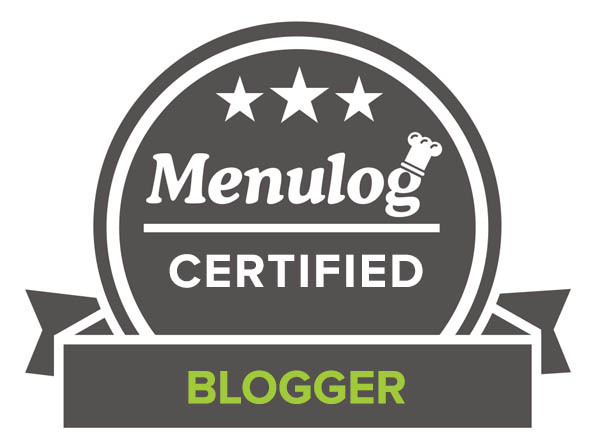 Glad you final exams are over and you can get back to blogging and baking the things you love. What a sweet birthday wish – in more ways than one! – and boy, that looks delicious. Great combo of flavours! I can imagine the crunchy topping to just melt in my mouth. Way to rock out Pie’s Birthday! Looks incredible! Nice to see you back in the kitchen and making these lovely creations. 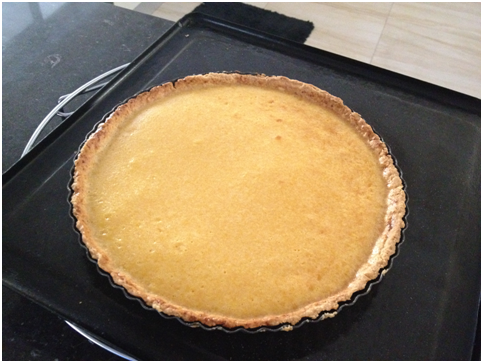 The tart looks wonderful and you are a very good friend! What a great way to celebrate a birthday! “Pie” must be just thrilled – I would be too! Absolutely stunning (like your friend??)! What a lovely way to honor Pie and friendship. Just got to see if I can find passion fruit filling here in the States. You´re one wonderful friend and blogger Uru! Passion fruit, such a fabulous tasting fruit for a tart! I’m on board with this pie!! Love passion fruit and in combo with creme brulee, what could be better? Beautiful and very tasty looking! Bet your family loved it! Aw, such a sweet post! Very appropriate for something as sweet as this! Really nice looking tart. And I’m all for anything where I can use a torch! That’s one of the sweetest posts I’ve read in a while! Sounds like such an awesome person. 🙂 Happy belated to her- and what a pretty pie to celebrate! 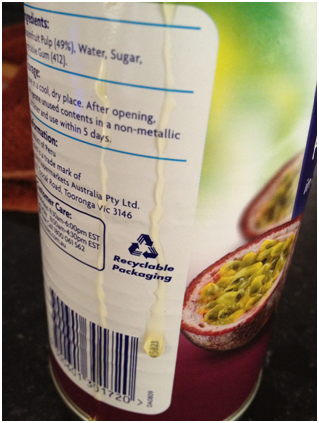 Passionfruit and cream= amazingness. Wow, so impressed! Love your posts. And how wonderful of a friend you are! 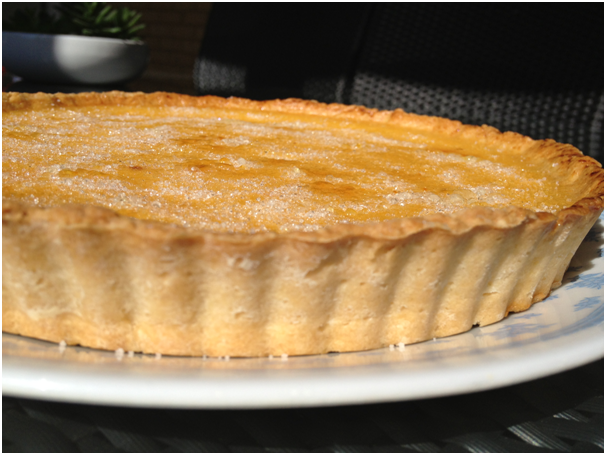 The tart is absolutely dazzling! I loved the torch effect! Your friend *pie* is one lucky girl. This is gorgeous. My daughter’s birthday is just 3 days apart from yours 😉 What a delicious pie to celebrate – even if it is belated pie. Looks scrumptious! Girl, you’re absolute amazing – here you are on your autumn break and you bake .. and bake and bake and bake. Love passion fruit – but not keen on pie, as you know. Next week will I post my total vegan dessert – had you in mind … Even if I don’t like pies I enjoy your photos and your posts – and most of all your PASSION. Bring more on…. to me. Aww that is really sweet I cannot WAIT to see your vegan creation! Those passionfruit seeds are so pretty! I would LOVE to get that tart for my birthday!!! Stunning! Wow! That tart looks amazing! Lovely post Uru! Beautiful tart and happy birthday to your friend. 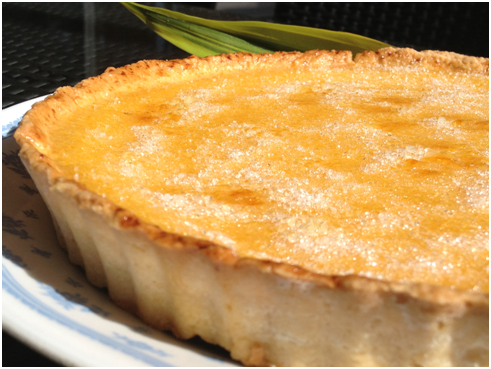 I am sure she loved it, who wouldn’t love a passion fruit creme brulee tart from CCU! 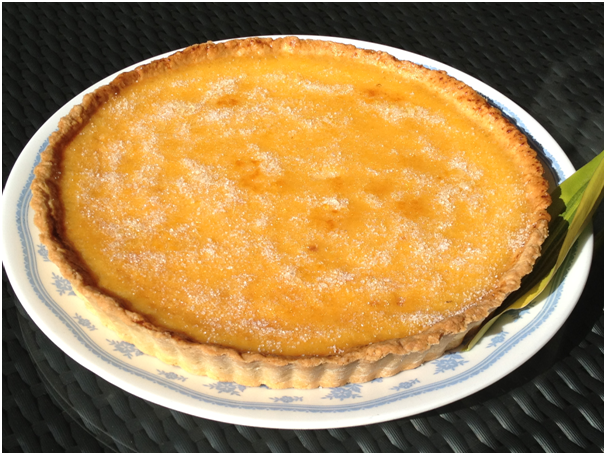 Yum yum – GREAT job, so delicious looking – a passion fruit tart, I can only imagine what it smells like! Yippee, another delicious reason to use my torch! A beautiful pie for a beautiful friendship! What a special birthday treat! Best wishes to your friend. Such a pretty tart and a lucky friend, great story! Funny how it often seems just like yesterday walking down memory lane. What a lovely post CCU and fantastic pie. A very gorgeous pie from a very generous girl. No doubt your friend loves her special b’day treat! Love a crunchy sugar top anything!! !